Has Wood County’s population increased or decreased since 2003? Has Wood County’s population increased or decreased since 2003? What’s the median age of county residents? How many Wood County residents live in poverty? Find out these answers and more in LIFE in Wood County, 2006 Wood County Community Asset Survey. The Asset Survey draws information from independent statistical data and a public opinion survey into one report that depicts the quality of life in Wood County. The report provides detailed data for a variety of key indicators, including: work, leisure education, public safety and the environment. The LIFE report is being used as a guide to help mobilize action and improve life in Wood County. It is also being used to stimulate discussion, create momentum and initiate change on a broad county-wide level. This is the second LIFE report. The first was published in 2003. 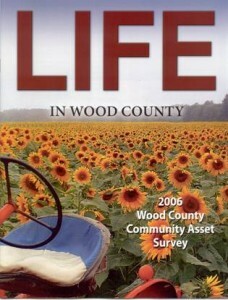 You can view and download the complete LIFE survey at www.woodcountyassetsurvey.com .